1. Insulation: Many forms of household insulation produce harmful particulate contaminants such as fiberglass and asbestos fibres, as well as gaseous contaminants including various VOC's and formaldehyde. 2. Pressed wood in furniture and flooring: manufactured with formaldehyde, which is released as gas. 4. Dust Mites: the excreta and body parts of these organisms are a common allergen, a particular problem in bedrooms. 5. Lead: found in older paints and plumbing pipes. 6. Aerosols in personal care products: a common source of organic gases, some of which are suspected carcinogens. 7. Gas stove: can be a source of combustion by-products. 8. Household cleaning products: can contain many harmful volatile chemicals. 9. Pesticides: source of extremely toxic and volatile chemicals that can be released into indoor air. 10. Smoke from fireplace or wood stove: open fireplaces can produce ash dust, carcinogenic tars, and combustion by-products like carbon monoxide and nitrogen oxides. 11. Wall coverings: plasticized wallpapers can emit VOC's; wood paneling is often manufactured with formaldehyde. 12. Draperies: treated fabrics can contain formaldehyde. Curtain folds collect dust. 13. Tobacco smoke: tobacco smoke contains 43 carcinogens; the danger to nonsmokers from second-hand smoke, especially to children, is now becoming recognized. 14. Carpets: source of formaldehyde. Harbor dust, dust mites and animal dander. 15. Paints and solvents: these are sources of many volatile chemicals which are easily vaporised and enter household air. 16. Fuels: storage of gasoline, kerosene, and other fuels can release volatile chemicals into household air. 17. Pet Dander: animal hair and skin flakes are common sources of allergens. 18. Auto exhaust: such fumes can enter the home from the garage or nearby traffic flow. 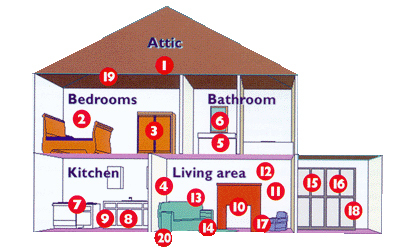 Carbon monoxide is the primary danger, and has a cumulative effect in the human system. 19. Asbestos: the particles of this carcinogen can be released into the air if asbestos insulation or pipe cladding is disturbed during house repairs. Asbestos fibers reside in lung tissue and can cause lung cancer or emphysema. 20. Radon: radon gas is a natural emission where uranium exists underground. Radon carries radioactive particles that are a known cause of lung cancer.